The tile specialist’s latest trading update revealed a 2.3% decline in like-for-like (LFL) sales for the 13 weeks ended July 1, as Topps reports challenging market but strives to stay ahead with investments in promotional activity and a stronger range. It follows a similar drop off in Q2, when LFLs were down 2.2%, resulting in a flat first half for Topps, despite posting a 3.4% LFL increase in the first quarter. The group said trading was reflective of “a weaker consumer environment” but maintains that the business is still in a strong position and continues, “to continue to outperform the overall tile market”. In response to the tough trading environment, Topps said it has maintained its focus on tight cost control and strong underlying cash generation; completing a refinancing of its loan facility, which comprises a £35million revolving credit facility with a £15million accordion. In a bid to strengthen its customer offer and remain competitive, the business has also invested in retail promotion activity and has focused on sustaining price leadership in the trade sector. Topps Tiles CEO Matthew Williams said: "The trading environment remained challenging during the third quarter but we are pleased with the resilience of our performance which we believe remains ahead of the overall tile market. Our business has a market-leading position, remains well-invested and is in a strong position to capitalise on future growth opportunities as they arise. “We have approximately doubled the size of our addressable market through our expansion into the commercial tile market segment and are focused on leveraging our specialism and competitive advantage across both retail and commercial channels." 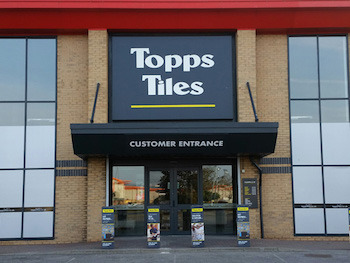 Topps said it is making good progress with its core strategy of “Out-Specialising the Specialists" in order to extend the company’s market-leading position in the UK tile market. It has been focusing in-house on developing product differentiation from competitors and bringing exclusive rages to market. During the quarter, it extended its Statements range of indoor/outdoor tiles, extended its trade brands, and listed exclusive product collections into its commercial business, Parkside. In total, Topps has launched over 20 new ranges this year. Topps continues to grow its estate and currently operates 375 stores within the UK, having opened two and closed three stores during Q3. In 2017, it traded from 367 stores.